On Tuesday, April 16, 2019 Mark Garnier MP, the US regional Envoy for the Department for International Trade London, visited Philadelphia with Alexandra Hall Hall, Brexit Counsellor from the British Embassy in Washington, D.C. The BABCPHL had the honor of welcoming Mr. Garnier and Ms. Hall Hall for a VIP luncheon discussion about Brexit at The Palm restaurant in Philadelphia. The visit was perfectly timed as the world watches the UK’s momentous decision evolve. Appointed by the Prime Minister, Mr. Garnier is the British Government’s US Regional Envoy. He is focused on promoting UK/US trade and investment ties across the US, through engagement with local governments, relevant trade bodies, Congressional representatives in their districts, investors and regional media. Mr. Garnier is supported by the UK’s US network, and plays a key role in helping open markets, unlocking barriers, and promoting deeper trade and investment links. Previously, Mr. Garnier was Parliamentary Under Secretary of State at the Department for International Trade from July 17, 2016 to January 9, 2018. He was elected as the Conservative MP for Wyre Forest in May 2010. Before coming to Parliament, Mr. Garnier spent 27 years as an investment banker and investment manager. During this time, he spent 15 years specializing in the emerging markets of South East Asia. Joining Mr. Garnier was Ms. Hall Hall, Brexit Counsellor at the British Embassy in Washington. Ms. Hall Hall is responsible for spearheading the work of explaining the UK’s departure from the European Union to US audiences, and promoting a continuing strong US-UK relationship post-Brexit. Prior to taking up this position she served as British Ambassador to Georgia from 2013 – 2016, and as a senior Non-Resident Fellow at the Atlantic Council think tank in Washington DC from 2016-2018. Mr. Garnier and Ms. Hall Hall delivered remarks about the historic and strong relationship between the two nations; the current geopolitical situation in Europe; and the positive outcome Brexit will have, not only for the UK, but for the rest of the world. Attendees were privy to a candid discussion about the complicated process and the careful decisions that must happen to proceed. BABCPHL guests were invited to ask questions, which focused on data privacy, Northern Ireland, party politics, pre-WWII geopolitical sentiments, as well as other issues. BABCPHL members garnered a much greater understanding of how the Brexit process might progress. The open dialogue provided everyone with an invaluable opportunity to more deeply understand the current situation. Click here for a link to photos. On Thursday, February 28, 2019, the BABCPHL partnered with the Philadelphia Orchestra for a magnificent concert held at Verizon Hall at the Kimmel Center. Nearly 50 BABCPHL members and friends gathered for a special behind the scenes tour; meet and greet with musicians; and reserved seats for the concert, featuring special guest, British performer, Benjamin Grosvenor. BABCPHL President Michael Pedrick started the evening with opening remarks. He introduced us to Orchestra President and CEO Matías Tarnopolsky and Executive Director Ryan Fleur. Geoffrey Cohen, Director of Audience Development for the Philadelphia Orchestra, welcomed our group. He, along with Kayla Delgado-Partridge, Audience Development Manager, led BABCPHL guests on a special behind the scenes tour of the Kimmel Center. We were joined on the tour by cellist Richard Harlow, who provided a great amount of extra information from a musician’s perspective. At one point during the tour, the group got to stand on the stage of Verizon Hall to have the same perspective as the musicians who were performing later that evening. We also got to see some dressing rooms, as well as where the different instruments are stored. After the tour we returned to the Green Room, where we were introduced to Paul Arnold, one of the violinists in the Orchestra. Paul energetically told the group some information about the pieces of music we would be hearing that evening. After his remarks, Michael thanked the musicians, as well as Geoff and Kayla, for hosting and taking the time to talk with us. BABCPHL guests then had some time to purchase food and drinks before the concert began. The Philadelphia Orchestra performed three pieces: Haydn’s “Symphony No. 94 in G Major (“Surprise”); Beethoven’s “Piano Concerto No. 1 in C major, Op. 15”; and Beethoven’s “Symphony No. 4 in B-flat major, Op. 60.” British pianist Benjamin Grosvenor was featured in the Piano Concerto. Playing the complicated music with ease, Grosvenor received a standing ovation at the end of the piece. He has been described as “one in a million…several million” by The Independent. At the age of 19, he was invited to perform with the BBC Symphony for the first night of BBC Proms. He has performed all around the world, and in 2011, signed to Decca Classics. He is the youngest British musician ever to sign to the label. The BABCPHL group had the lucky opportunity to meet with Grosvenor during intermission. He graciously answered questions and posed for a few photos. The BABCPHL was honored to partner with the Philadelphia Orchestra for an outstanding night of incredible music. Special thanks to the Orchestra for working with us to provide this wonderful opportunity to our members and friends. On Thursday, March 1, 2019 the BABCPHL welcomed the Welsh Government Minister for International Relations and the Welsh Language, Eluned Morgan, Baroness Morgan of Ely, Labour Assembly Member in the National Assembly of Wales to Philadelphia for an official visit and exclusive, by invitation only VIP lunch hosted by Drinker, Biddle & Reath LLP. The Minister’s day in Philadelphia began with private sector company meetings and a visit with Mayor Kenney and the Commerce Department. Mayor Kenney and Minister Morgan share similar political views on several hot button topics. The Minister led an open forum discussion with the BABCPHL about pressing global matters during the last stop on her itinerary in Philadelphia. Jill Bronson, Regional Partner in Charge of the Philadelphia Office of Drinker Biddle & Reath, welcomed the Minster and all attendees to the Firm’s beautiful board room overlooking the Parkway. Michael Pedrick, BABCPHL President, thanked Jill and everyone for gathering. He introduced the Minister, whose political career started at the age of 27 when she was elected as the youngest Member of the European Parliament in 1994. Minister Morgan was only the fifth woman elected to a full-time political position in the history of Wales, and the first full-time politician in Wales to have a baby while in office. She is a former Member of the European Parliament who represented Wales for the Labour Party from 1994-2009. In this role she became the Labour spokesperson on industry, science and energy and spokesperson for the 200 strong Socialist Group on Budget Control matters. She authored the Green Paper on energy on behalf of the EP and led the Parliament’s discussions on the Electricity Directive where she ensured new rights for consumers and demanded that Member States of the EU addressed the issue of fuel poverty. From late 2009 until July 2013 she worked as the Director of National Business Development in Wales for SSE (SWALEC), one of the UK’s largest energy companies. She was responsible for the establishment of the SWALEC Smart Energy Centre in Treforest. She was also appointed as the Chair of the Cardiff Business Partnership. From 2013-2016 she served as the Shadow Minister for Wales in the House of Lords, and from 2014-2016 she served as Shadow Minister for Foreign Affairs and also as a whip. In 2018 she stood as the only female candidate in the Labour Party Leadership election to succeed Carwyn Jones as First Minister. The new First Minister, Mark Drakeford named her as Minister for International Relations and the Welsh Language in his new cabinet. Minister Morgan chose Philadelphia as her first official overseas trip in her new position. She began her brief presentation to BABCPHL guests highlighting the strong historic and commercial ties between the greater Philadelphia region and Wales. Minister Morgan talked about the stability of the Welsh government; the economy and the investment climate; the Welsh position on Brexit; climate change; energy; and other important issues. She encouraged unrestricted dialogue with attendees. While most questions focused on Brexit, tariffs, and the possible scenarios that could develop during the coming weeks, other areas of discussion included the evolution of the Welsh economy from mining, to agriculture and high-tech, sustainability, education, and legislation that will affect the next generation, specifically the Well-Being of Future Generations Act. Minster Morgan’s visit coincided with St. David’s Day – a Welsh national holiday in commemoration of St. David, the patron saint of Wales. It is a day of celebration of both St. David’s life and of the Welsh culture in Wales and abroad. The BABCPHL was honored to welcome Minister Morgan to the City on the commemorative St. David’s Day, and extends sincere gratitude to BABCPHL Club Level Member, Drinker Biddle & Reath for hosting the Minister for a delicious lunch, including homemade St. David’s Day Welsh cakes in the Philadelphia Office. On Thursday, December 6, 2018, the BABCPHL hosted our Signature Annual Holiday Luncheon in the Grand Ballroom at the Ritz-Carlton. Throughout the year we are proud to offer the international business community opportunities to gather with likeminded individuals to create valuable relationships, and to learn more about links with the UK. Nearly 200 global executives and leading UK and regional government officials participated in this event. The room was buzzing with networking and merriment. This year’s program featured Harold Epps, Director of Commerce for the City of Philadelphia, and Chellie Cameron, Chief Executive Officer of Philadelphia International Airport. Michael Pedrick, BABCPHL President, opened the meeting and welcomed special guests and speakers. He introduced Harold who graciously stood-in for Mayor Kenney who had cancelled all previously scheduled public appearances due to the death of his father earlier in the week. Harold oversees and implements policies to help both small businesses and major corporations in Philadelphia thrive. Commerce coordinates activities along neighborhood commercial corridors with small businesses and entrepreneurs, major real estate development projects, large-scale business attraction and retention efforts, as well as efforts to increase minority-owned business contracting opportunities. Harold and his team create a favorable environment for foreign direct investment, and for regional companies to successfully grow and expand in other areas. This October, the Mayor’s Office and Commerce led a successful business development and retention mission to the UK. Michael thanked Harold for his focus on the UK, and welcomed him to the podium to speak about our region’s strong relationship with Great Britain. Harold talked about UK investment in Philadelphia; the City’s commitment to UK business ties; and the recent trip. Harold also lauded the BABCPHL for growing UK business in the area, and he introduced Chellie. Rochelle (“Chellie”) L. Cameron is the Chief Executive Officer of the Philadelphia International Airport and the Northeast Philadelphia Airport, a large hub airport system serving over 30 million passengers annually. Chellie oversees the planning, development and administration of all activities for the City’s Division of Aviation – which through a $484 million operating budget and a $665 million capital budget, respectively, generates more than $15.4 billion in annual spending to the regional economy and accounts for more than 96,300 jobs within the region. She has made enhancing the customer experience, improving current airport facilities and expanding the airport for the future her top priorities. Chellie spoke about the Airport as an economic engine driving development for our region with a focus on UK connections. She provided valuable statistics about the Airport’s growth and strength not only here in the Greater Philadelphia area, but all of the connections to cities throughout the US and the world. Chellie’s presentation included a very special pre-recorded video of immediate prior BABCPHL President, Rhett Workman in London, England. At the beginning of 2018, Rhett left his post at American Airlines in Philadelphia, and was named Managing Director at London Heathrow for the Airline. The room clapped and cheered as Rhett took us on a tour of London hot spots where we met people who spoke about their interests in Philadelphia. Following a delicious lunch, our sponsors from American Airlines and HSBC Bank each spoke for a few minutes about their companies and their commitment to the BABCPHL. Jim Moses, Vice President, PHL Hub Operations, American Airlines talked about the Airline’s presence at the Airport and the strong and growing connections to the UK and beyond. Kristin Malo, Senior Vice President, North East Team Leader, International Subsidiary Banking, HSBC USA focused on the Bank’s long history collaborating with the BABCPHL. Headquartered in London, HSBC Bank USA, N.A. is one of the largest banking and financial services organizations in the world. Our last speaker was Ben Brierley, Vice Consul and Head of Advanced Manufacturing for the British Embassy Network and the Department for International Trade (DIT). He leads a geographically dispersed virtual team across the US, supporting UK exporters and engaging with US inward investors to the UK. Ben is responsible for planning and delivering sales and marketing campaigns, resource planning, and strategic leadership. As a Vice Consul with the British Consulate, he is also involved with supporting broader activity for the British Government in the US. Sectors within Ben’s domain include Aerospace, Space, Chemicals, Food & Drink, AgriTech and Manufacturing. He talked about DIT and the relationship with the BABCPHL. Ben also congratulated Howard Silverstone, BABCPHL Membership Chairman, prior two-time President, and Board Member on his recent appointment by Her Majesty The Queen as a Member of the Most Excellent Order of the British Empire (MBE). MBEs are given to individuals who have made great efforts to contribute to their respective communities. Howard’s tireless volunteer work for the British American Business Council of Greater Philadelphia for more than a quarter century is an example of this. While Howard is occupied day in and day out with his privately owned and managed forensic accounting firm – Forensic Resolutions – he always finds time to dedicate several hours per week to the BABCPHL. His commitment has had immeasurable impact on the region’s relationship with the UK both financially and culturally. Howard is an outstanding ambassador for the UK in the US. It would not be a BABCPHL holiday event without some fun and good cheer. Christmas crackers were popped, paper crowns were donned, and Howard, BABCPHL’s very own stand-up comedian, was the Master of Ceremonies for our coveted gift giving tradition. Our program concluded with more than 20 raffle prizes given to lucky business card draw winners from local retailers, restaurants, hotels and sports teams, including American Airlines AAdvantage miles for a pair of round trip, Business Class tickets on American Airlines’ award winning, non-stop service from Philadelphia International Airport to London, England. Special thanks to BABCPHL 2018 Holiday Lunch headline sponsors, without whom this program would not have been possible: HSBC Bank USA, N.A. ; American Airlines; Almac Group; Deloitte LLP; and The Welsh Government. Best wishes for a happy, healthy and prosperous holiday season. We are thankful for your support and look forward to seeing you in the New Year. On Thursday, January 31, 2019, the British American Business Council of Greater Philadelphia partnered with the Chilean, French, German, Irish, Israeli, Japanese, Norwegian, and Russian Chambers of Commerce as well as the Delaware Division of Small Business, the Delaware Prosperity Partnership, the New Castle County Chamber of Commerce, and the World Trade Center Delaware, for a tristate area networking event. More than 150 global business professionals and government leaders participated. Internationally minded executives with operations in Delaware, New Jersey and Pennsylvania mingled and exchanged ideas in the striking, bright, open, main lobby of Hercules Plaza. Business cards were exchanged and global connections were made throughout the two hour program. This international event was hosted by 1313 Innovation/McConnell Johnson Real Estate. Founder, Paul McConnell, is a BABCPHL Club Level and Board Member. 1313 Innovation’s mission is to enrich Delaware’s business community by being the most groundbreaking resource for professionals and students. 1313 strives to connect business leaders, and universities to transform Wilmington into the epitome of innovation. They support the development of its members in their roles as business leaders mainly through local and national networking, strategic alliances and partnerships in education. Our group was honored to help Paul and his team meet their mission through collaboration on this second annual international gathering. Paul and his colleagues Lauren Spinelli and Shona Grace, at 1313 Innovation and McConnell Johnson Real Estate graciously welcomed our group. Event sponsors also included: DLAPiper and the University of Delaware. The event involved executives from a wide range of industry sectors, and businesses with operations in the three states, and the across the world. After brief remarks from BABCPHL President Michael Pedrick, sponsor introductions, and comments from: Paul McConnell, Managing Member, McConnell Johnson Real Estate; Matt Denn, Partner, DLAPiper; Ted Foltyn, Adjunct Faculty, Horn Entrepreneurship, University of Delaware; Kurt Foreman, President & CEO, Delaware Prosperity Partnership; and Millar (Joe) White, Vice Consul, Trade & Investment Officer – Technology, Department for International Trade, British Embassy, there was a business card raffle draw for exciting prizes such a as international chamber branded gear, wine, coffee table books, guest passes to future events, and four seats to a 2019 Philadelphia Union home soccer game. Guests networked and continued to mix and mingle long after the event officially ended. Sincere thanks to all sponsors and partners. Click here for photos. On Thursday, November 8, 2018, the British American Business Council hosted a membership development and Young Professionals Group (YPG) happy hour at the Pyramid Club. Approximately 75 people gathered for a great evening of networking. The views of the Philadelphia skyline were outstanding, and the British-inspired food and drink were delicious. Michael Pedrick, BABCPHL President, welcomed guests and spoke briefly about the BABCPHL mission and history. He thanked all attendees and recognized sponsors: The Bartlett Group and Lord Abbett. Bartlett is a third generation family-owned boutique international insurance broker. The Company is a 75 year old UK-based business with US headquarters in Philadelphia. They recently celebrated their 25th anniversary in Philadelphia, and are one of the founding members of the BABCPHL. Bartlett is a Club Level member with a seat on our Board of Directors. Lord Abbett is a private investment management company offering a variety of fixed−income and equity strategies to individual and institutional investors. We were introduced to Lord Abbett by Jason Walker – one of our Young Professional Group Co-Leaders. The BABCPHL YPG began in May 2012. The purpose of the BABCPHL YPG is to provide a forum for members under the age of 40 to develop valuable business contacts within the British American business community and to exchange ideas and information with a cross section of industry professionals, trade and government officials. The BABCPHL YPG fosters professional ties and enables participants to build valuable business connections. YPG gatherings engage our under-40 members. Jason Walker and Adam Jones are our YPG Co-Leaders. Jason spoke briefly about their experience with the BABCPHL, the types of events we offer, and why the organization is beneficial. Before the business card draw, Michael introduced all of the BABCPHL Board Members present for the event: Wes Cronin, HSBC Bank; Dennis DiMarco, Virgin Atlantic Airways; Bruce Einstein, Bartlett & Company; Ralph Estel, EisnerAmper; Howard Silverstone, Forensic Resolutions; and Efe Sokol, Welsh Government. 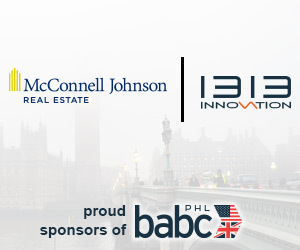 BABCPHL Board Members volunteer their time to promote business between the UK and the Greater Philadelphia region. We are very grateful to all board members for their time, commitment and generosity. To cap off the evening, Michael invited Kevin Saad from Philadelphia Union to draw the three winning business cards. Philadelphia Union is a longtime member of the BABCPHL and actively participates in many of our activities throughout the year. Lucky winners received a British American Business Council branded umbrella, baseball cap and wall calendar; lunch for two at the Pyramid Club; and four Club seats to a 2019 Philadelphia Union game. Michael closed by inviting everyone to our next program, the BABCPHL Signature Annual Holiday Lunch on Thursday, December 6, 2018 at the Ritz Carlton in Philadelphia. This event will feature Honorable Jim Kenney, Mayor of Philadelphia, and Chellie Cameron, CEO, PHL International Airport. It is always a festive midday event with significant giveaways including round trip airline tickets to London. Networking continued long into the evening. The BABCPHL extends special thanks to the Pyramid Club for hosting our event. •Reserved VIP seating to enjoy a performance of Beethoven and Haydn by Benjamin Grosvenor. On Thursday, March 7, 2019, the British American Business Council of Greater Philadelphia hosted the eighth annual New Jersey Networking Event and Dinner at The British Chip Shop in Haddonfield, New Jersey. The event sold out shortly after registration opened! Approximately 50 BABCPHL members and friends occupied the restaurant for a fun-filled pub night. The new Chip Shop proprietors offered attendees an outstanding selection of specialty beers and delicious appetizers, a traditional British pub style main course, and traditional tea and biscuits and sticky toffee pudding for dessert. Adding to the enjoyment of the evening, the Philadelphia Union presented each attendee with two complimentary tickets to a Philadelphia Union home game, and lead sponsor, United Airlines offered three mileage plus gold status memberships. Howard Silverstone, BABCPHL Membership Chairman, welcomed attendees. Howard introduced special guest, Ross Allen, Director, North America, Department for International Trade who discussed the important relationship the State of New Jersey has with the United Kingdom. Howard thanked Ross and his team for supporting the BABCPHL, and provided guests with a brief introduction about the Organization, before asking each event sponsor to say a few words. Leon Dutkiewicz, Partner, Citrin Cooperman; Jay Jumper, Partner, Pepper Hamilton; and Richard Chibbaro, Sales Manager, United Airlines, each spoke briefly about their relationship with the BABCPHL and their companies. Following sponsor remarks, winning business cards were drawn for three United Airlines mileage plus status memberships. Attendees were then invited to sit and enjoy dinner. Guests remained long into the evening, continuing to mingle. We extend special thanks to lead sponsors, Citrin Cooperman, Pepper Hamilton LLP, and United Airlines; supporting sponsors, the Department for International Trade and Forensic Resolutions; and door prize donor, Philadelphia Union. On Tuesday, October 23, 2018 the British American Business Council hosted an educational seminar about US and European current policy issues affecting transatlantic business. The French, Irish, German and Swedish American Chambers of Commerce partnered with us for this topical program. Michael Pedrick, BABCPHL President and Partner at Morgan Lewis & Bockius introduced panel moderator, Duncan Edwards, Chief Executive Officer, BritishAmerican Business (BAB). The Organization’s mission is to support policies to protect and enhance the bilateral trade and investment environment. Duncan is also the chief executive of the British American Business Council, the umbrella organization of more than 20 chapters worldwide, of which the BABCPHL is one. BAB regularly publishes valuable thought leadership policy documents, and Duncan is often called upon by business and media outlets to discuss the current transatlantic business climate. He was the perfect person to lead speakers through the meeting. Presenters included: Leon Dutkiewicz, Managing Partner, UK US Tax Services; Jonathan Grode, US Practice Director, Green and Spiegel; Stefan Reisinger, Morgan, Lewis & Bockius; and Chris Shull, Founder & President, Engaged Impact. Duncan kicked-off the symposium by briefly discussing the current state of transatlantic economic relations. Having just returned from London, where he met with Liam Fox and several c-suite executives from global multinational companies, the topics presented were top of mind. Before each speaker dove into greater detail about the topic they were each presenting, Duncan provided a high level overview of what is happening in the tax, data security, tariffs and sanctions, and global mobility arenas. An efficient and stable tax environment can stimulate innovation and facilitate growth. The US, UK and the rest of Europe need to maintain and modernize tax systems to trigger positive change; FDI is a priority, as are tax incentives, and clear tax rules. There has been increased activity and a nearly constant stream of news about trade sanctions and tariffs. Different drivers for sanctions and tariffs include security sanctions; discontent with the WTO; and the perception that the current system is stacked against the US. Talent is closely tied to economic success. The ability to draw in a pool of talented workers regardless of nationality or origin is essential for economic growth and competitive advantage within a globalized economy. Governments have to balance public concern over immigration with the economic reality of the value immigrants provide. Lastly, data is the essential currency of the modern economy, and digital trade is a priority across all industry sectors. Data mobility creates new business opportunities, lowers costs and makes employee mobility easier. The EU and the US have the highest cross border data flows in the world. Challenges and next steps include developing supportive legal frameworks and privacy shields. Cybersecurity is a fundamental part of business daily operations and strategies. Federal agencies must harmonize existing regulation, and education is key. Chris Shull, Founder & President, Engaged Impact provides information security, privacy leadership and transformation consulting to small and mid-sized businesses. His experience includes delivering, implementing and managing private, public and hybrid cloud-based information technologies. Chris spoke about GDPR, and briefly mentioned some of the legal and technical requirements. His discussion focused on compliance, and what companies should to do to survive and thrive in the current business environment. He mentioned there are great opportunities to do things at a new level, but the main things to watch out for are cyberattacks and threats. Companies and executives need to know how to approach dangers, and qualified professionals and systems must be put into place. There are fairly straightforward frameworks available for understanding the requirements. Even if a particular company does not require due diligence and GDPR, their clients/customers may. There are real legal and existential risks/cyber issues. Jonathan Grode, US Practice Director, Green and Spiegel, is an immigration attorney focused on obtaining nonimmigrant and immigrant visas for new company start-ups, professional workers, artists and entertainers, athletes, physicians, and scientific researchers. He has significant experience dealing with Department of Labor and Department of Homeland Security enforcement actions as well as with EB-5 investor filings. Jonathan explained how politics drive global mobility. He talked about the Trump Administration, and how other countries such as Canada and France are managing their policies in light of recent US and UK patterns and changes. Jonathan focused his discussion on what drives government policies, and he provided practical comments about what companies should be thinking about in the current political climate. Stefan Reisinger from Morgan, Lewis & Bockius advises clients on US and multilateral export, economic sanctions, anticorruption, and customs matters. He has led comprehensive, worldwide, investigations and audits and responded to enforcement actions involving multiple jurisdictions and government agencies. He also has experience with customs regulatory issues such as classification, valuation, origin determination, marking, preference programs, import restrictions, quotas, drawback, and trade agreements. Stefan discussed the underlying policy driving sanctions and tariffs – trade policy and tariff actions. He talked about recent sanctions with cross border implications, and how companies should navigate the changing landscape. Specific topics Stefan addressed included the: US secondary sanction with Iran; EU blocking statute; implications of Brexit; and Russian sanctions. Stefan also covered recent tariffs – 201, 232, steel and aluminum – 301 actions – and what the tariffs are doing and the requirements such as exclusion request, and customs mechanisms. Leon Dutkiewicz, Managing Partner of UK US Tax Services, specializes in international tax, representing clients who have business operations in multiple jurisdictions or who are globally mobile individuals. Leon deals with many complex tax laws such as structuring global acquisitions/divestitures, analyzing income tax treaty benefits, assisting with transfer pricing implementation and managing multi-state tax issues, and compliance services. He began his presentation by speaking about the recent tax changes implemented in Europe and the US, where we just came from, and where we are going. Leon reported on inbound companies (coming into the US) – corporate tax rate, and outbound companies (looking to operate outside of the US). He discussed creative planning opportunities; code section 199a Cafe- 20% income exclusion; foreign tax credit planning; closely held companies – pass through concepts; owning foreign companies; the GILTI tax; Beat Provision in the tax reform bill; and trade and tariffs – boycott reporting. A dynamic question and answer session followed speaker presentations. Questions included the jurisdiction of which cybersecurity rules apply to employees who work in multiple countries; tariff reclassification; and immigration adjudication trends. BABCPHL President Michael Pedrick closed the meeting by thanking panelists, sponsors – Morgan, Lewis & Bockius LLP; UK US Tax Group LLC; and The Welsh Government – and reminding attendees to join the BABCPHL for upcoming programs on November 8 for networking at the Pyramid Club and on December 6 for our signature annual holiday program featuring Chellie Cameron, CEO, PHL International Airport. The U.S. Department of Commerce’s Office of Intellectual Property Rights, the U.S. Patent and Trademark Office and the U.S. Commercial Service cordially invite you to attend the STOPfakes.gov Road Show, an Intellectual Property Rights Enforcement Outreach Program. This is an opportunity to learn the basics of intellectual property rights (IPR) protection and U.S. government resources available to help small and medium-sized enterprises (SMEs) protect their IPR at home and abroad. This program will feature presentations by intellectual property experts and law enforcement officials, including one- on-one meetings with experts from industry and government.